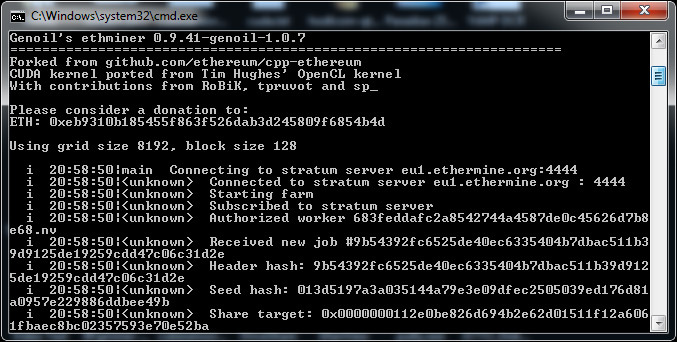 The ethminer 0.9.41 Genoil fork 1.0.7 (source) is now out of beta and we have compiled a Windows binary (64-bit only) for the people using it to mine on their Nvidia GPUs or maybe AMD as well. Genoil’s fork of ethminer is targeted at Nvidia CUDA miners, but also works on AMD OpenCL for mining of Ethereum (ETH). The 1.0.7 has some minor bugfixes since the recent beta release and it comes with failover support for Stratum mode along with the already available in previous releases failover support for the standard mining mode. 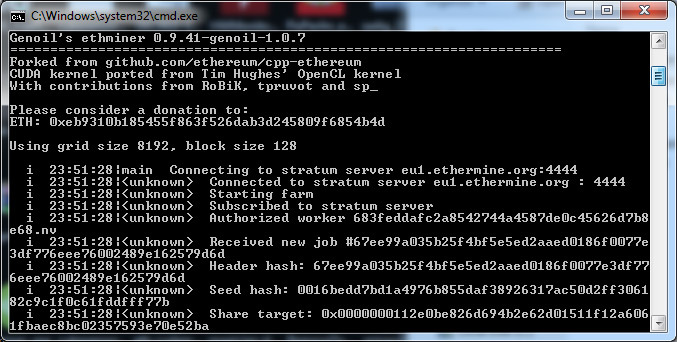 You are welcome to download and try the compiled binary of the latest 1.0.7 version and the Stratum failover. Check the included help.txt file and the example BAT file for more information on how to use the new Stratum failover mode, there are two versions included in the archive – one compiled with CUDA 6.5 and one with CUDA 7.5, both are 64-bit only. We have compiled a Windows binary (64-bit only) from the latest ethminer 0.9.41 Genoil fork 1.0.7 beta for Nvidia CUDA as well as AMD OpenCL mining of Ethereum (source). The latest code comes with the addition of failover support for Stratum mode along with the already available in previous release failover support for the standard mining mode. You are welcome to download and try the compiled binary of the latest git code for the new 1.0.7 beta and the Stratum failover and if you experience problems you should report them. Check the included help.txt file and the example BAT file for more information on how to use the new Stratum failover mode. We are also seeing a tiny bit of performance increase on Nvidia using the CUDA mode and apparently using the OpenCL on Nvidia should now also provide similar performance as CUDA (was slower before), there should not be no change in hashrate on AMD GPUs.